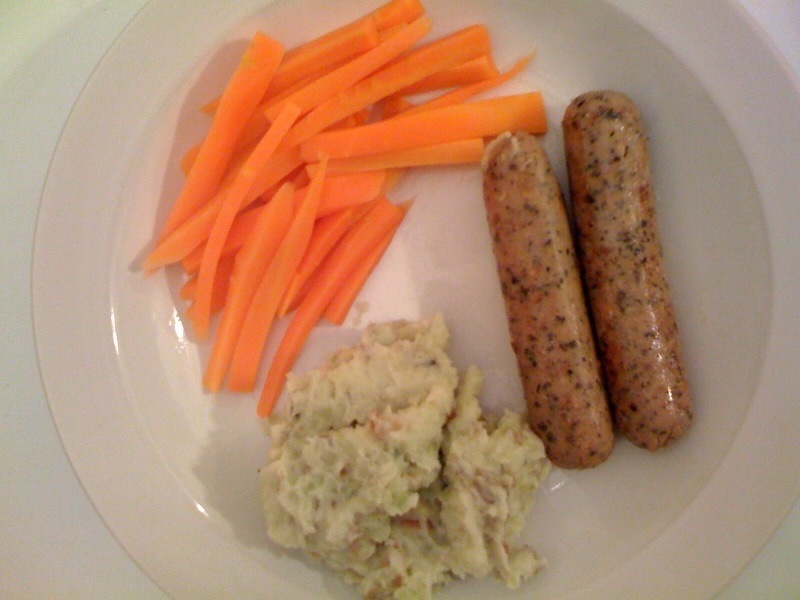 This meal resulted from my recent trip to Whole Foods where I found the sausages and potatoes. It’s my local organic version of bangers and mash! These are Bilinski’s organic chicken sausages. It was actually one of the very few local meat products I could find there and while it is on the outer range of my local zone being 140 miles away, I figured I may as well try it anyway. There was a little sign next to it in the refrigerated section with a picture of the father-daughter team that produce this product in upstate New York, which, seemed endearing. The sausages turned out to be delicious, flavorful, and so well seasoned that I didn’t have to do anything except heat them up. ALSO: they were only 90 calories each! I’m not big on counting calories, but in my head I always think sausage = fat so that was a nice surprise. For sides I made mashed fingerling potatoes with the skins from a farm in Kent, CT (bought at Whole Foods) and julienne carrots from my garden. Then for desert – Siggi’s Skyr. Entry filed under: Products, What's Cookin'. Tags: Bilinski, Connecticut Locavore, Dark Days Challenge, Siggi's Skyr, Whole Foods.